It used to be that themes were built for a certain shopping cart or a certain forum extension or a certain community extension but these days, every theme is built for the K" content construction kit and everything else can go whistle and who can blame them? It isn't that those things are all worthy of a theme - but K" is especially worthy as it really is an excellent extension with bags of potential - the others will all be gone in a year or two and you'll be stuck whistling, but I am starting to waffle - there is a new, big, very nice theme out from JoomlaBamboo. 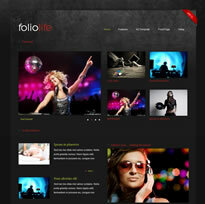 It is called Folio Life and if you can describe a theme as clean and grunge like, this is the theme - it is very clean but has those grunge like, dark features and I have no doubt it is built using the 960 grid system. It also has 60 module positions, comes with six colour schemes and is actually built using something called the Zen Grid Framework - something I will look into a little more but you can read about here at JoomlaBamboo - basically it is an easy way to manage layout, colours and sizes. So, want more information or a demo, click here.